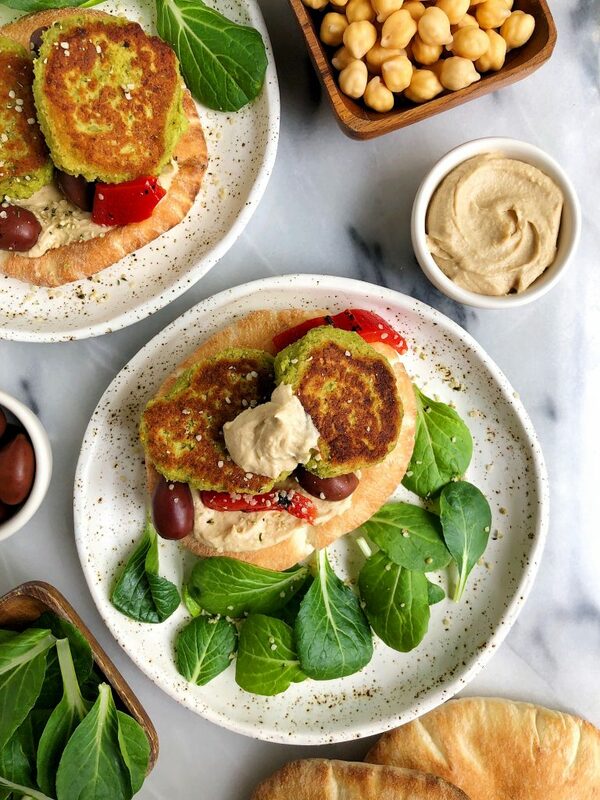 10-minute Crispy Green Falafels made with chickpeas, greens and other healthy and delicious vegan and gluten-free ingredients! Believe it or not for the first 18 years of my life, I never ate falafel. I had no idea what it was until I went away to college and my school served the dreamiest Mediterranean food and I pretty much fell in love. Every Monday they had crispy falafels and you could build a medi bowl filled with hummus, greens, pita, feta cheese and all the fixings. I then became obsessed (as I tend to do when I find new foods I love) and ordered it all the time at restaurants, food trucks, anywhere! Until I discovered that falafel was pretty much a glorified way of saying fried chickpeas. Now there is nothing wrong with eat falafel that is fried but if I want to eat it frequently, I’d prefer something a bit lighter. 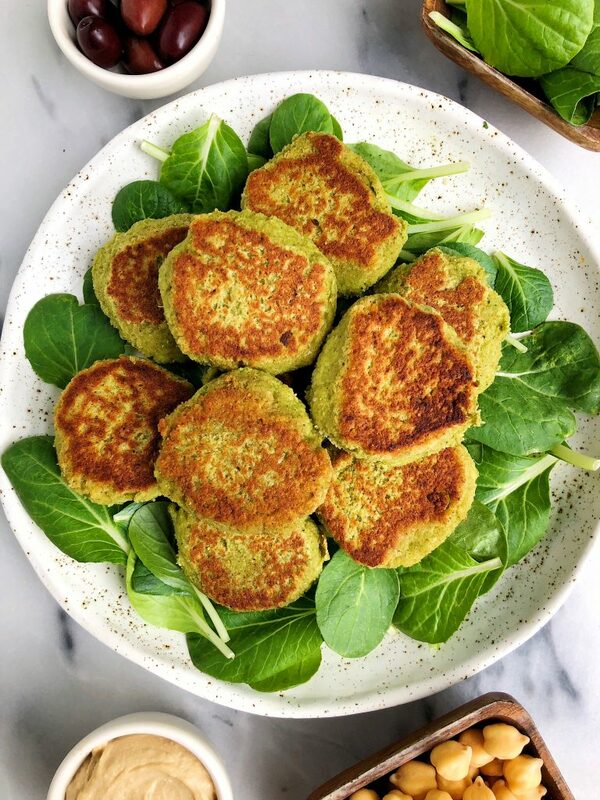 What I love about these Crispy Green Falafels is that they are ready in less than 10 minutes and they are made with all gluten-free and plant-based ingredients. They are even nut-free! You will absolutely need a food processor to pulse the chickpeas together and get them into the falafel dough-form. In this recipe I also added some Organic Girl greens to the mix. Their new Rebel Greens, which feature the most delicious bok choy. I shared the Rebel Greens back in the Avocado Greens Caesar Salad and now I am hooked. I love how they add extra nutrients to the falafel and it blends right on in. You will also need some oat flour or gluten-free flour and coconut flour to help bind everything together. I added a bunch of spices for flavor, some onion and scallions too. When it comes to actually cooking these falafels, I love using a cast iron skillet and simply pan-frying them in some grass-fed butter or avocado oil. I also give you instructions on how to bake them as well, it is totally up to you! But they do get crispier when you use the skillet! Don’t forget to serve these with your favorite pita bread, greens and some hummus. Tag me on Instagram so I can see your falafel magic! Optional parings: pita bread, greens, hummus, anything! *If you prefer to bake these in the oven, cook at 375 for about 10 minutes, flipping halfway through! 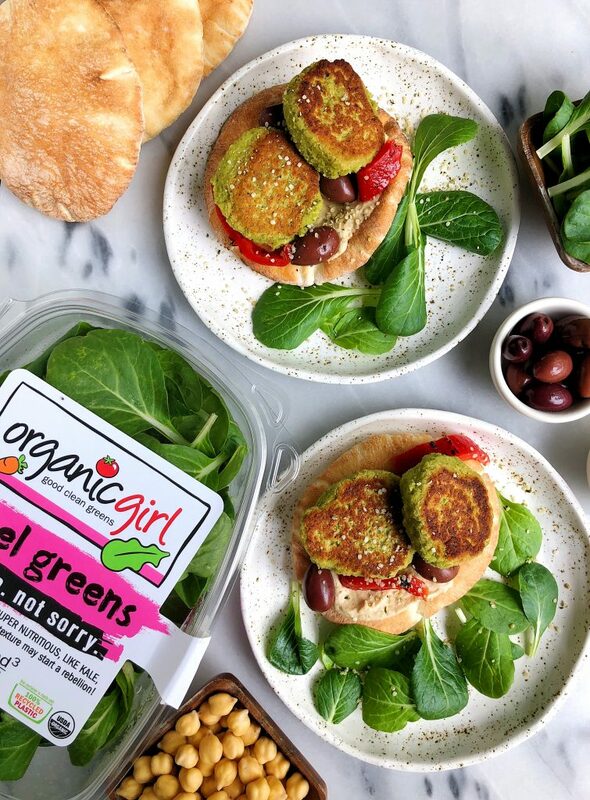 Thank you Organic Girl for sponsoring this post! It means so much to me to work with brands I love and believe in. omg yum!!!! this looks so good! Do they freeze well? omg yum!!!! this looks so good! Do they freeze well?? Could you use almond flour rather than oat flour?